June 19 – Gen. Gordon Granger arrives at Galveston to announce that slavery has been abolished, an event commemorated today by the celebration known as Juneteenth. A Freedmen's Bureau official stands between armed whites and blacks. Library of Congress. September – The Bureau of Refugees, Freedmen and Abandoned Lands (the Freedmen's Bureau) begins operating in Texas, charged with helping former slaves make the transition to freedom. March 15 – The Constitutional Convention approves an ordinance to nullify the actions of the Secession Convention. Aug. 20 – President Andrew Johnson issues a proclamation of peace between the United States and Texas. Cattle drives, which had been occasional in the 1830s, sporadic during the 1840s and 1850s, and almost nonexistent during the Civil War, begin in earnest, mostly to markets and railheads in Midwest. They are at their peak for only about 20 years, until the proliferation of railroads makes them unnecessary. March 2 – Congressional Reconstruction replaces Presidential Reconstruction, dividing the South into five military districts under the command of the army. Landowners at Del Rio form a company to begin first large-scale irrigation in Texas. The canal system is completed in 1871. Nov. 30 – Texas voters approve a new state constitution. Jan. 8 – Edmund J. Davis becomes the first Republican governor of Texas. Feb. 8 – The Legislature elected under the new constituion convenes. Its members include the first African-Americans, two in the Senate and 12 in the House. March 30 – President Grant signs the act readmitting Texas to Congressional representation. May – Seven men in a wagon train are massacred at Salt Creek, about 20 miles west of Jacksboro, by Kiowas and Comanches led by chiefs Satanta, Big Tree, Satank and Eagle Heart. October – Construction begins on the Texas & Pacific Railway; the 125-mile stretch between Longview and Dallas opens for service on July 1, 1873. March 15 – The Houston and Texas Central Railway reaches the Red River, connecting there with the Missouri, Kansas and Texas Railroad and creating the first all-rail route from Texas to St. Louis and the East. Spring – First African-American "Buffalo Soldiers" are posted to Texas frontier forts. Jan. 17 – The inauguration of Democrat Richard Coke as governor marks the end of Reconstruction in Texas. Sept. 28 – Col. Ranald Mackenzie leads the 4th U.S. Cavalry in the Battle of Palo Duro Canyon, an encounter that ends with the confinement of southern Plains Indians in reservations in Indian Territory. This makes possible the wholesale settlement of the western part of the state. Feb. 15 – The present state constitution is adopted. Oct. 4 – The Agricultural and Mechanical College, later Texas A&M University, opens at College Station, becoming the first public institution of higher learning in the state. Charles Goodnight establishes the JA Ranch in Palo Duro Canyon, the first cattle ranch located in the Panhandle. September – The El Paso Salt War is the culmination of a long dispute caused by Anglos' attempts to take over salt-mining rights at the foot of Guadalupe Peak, a traditionally Mexican-American salt source. Dec. 16 – The Texas & Pacific Railway reaches Sierra Blanca in West Texas, about 90 miles east of El Paso. The Old Main Building of the University of Texas. Briscoe Center for American History/UT. Sept. 15 – Classes begin at The University of Texas. Fence-cutting wars prompt the Legislature to pass a law making fence-cutting a felony. Aug. 19-21 – A hurricane destroys or damages every house in the port of Indianola, finishing the job started by another storm 11 years earlier. Indianola is never rebuilt. May 16 – The present state capitol is dedicated. April 3 – The Railroad Commission, proposed by Gov. James Hogg, is established by the Legislature to regulate freight rates and to establish rules for railroad operations. 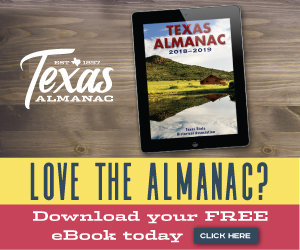 June 9 – Oil is discovered at Corsicana by workers drilling for water; a commercial field opens in 1896, becoming the first small step in Texas' rise as a major oil producer. May 16 – Teddy Roosevelt arrives in San Antonio to recruit and train "Rough Riders" for the First Volunteer Cavalry to fight in the Spanish-American War in Cuba. Texas experiences its coldest winter on record statewide.